Spring break season is in its prime, but several weeks have already come and gone since I was in Cancun enjoying the sand, sun, and surf that came with my final spring break. The tan lines have started to fade and I finally got around to uploading the dozens of pictures that were taken in sunny Mexico. While sifting through and picking out pictures where the majority of us were actually looking at the camera (for some reason looking at the camera is harder than you would think), there was one picture in particular that made me cringe ever so slightly. 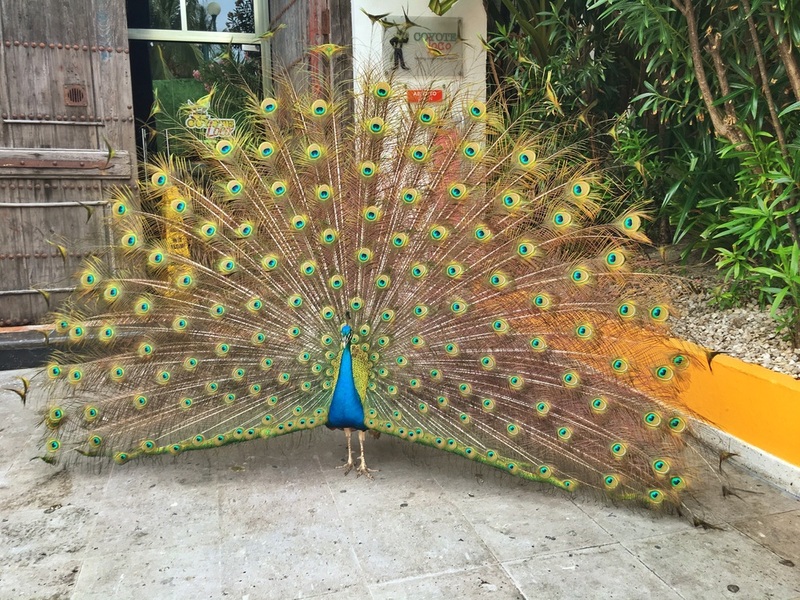 As beautiful as they look fanning out their feathers, peacocks typically do so for one of two reasons. The first of these two reasons is that the peacock sees a particularly fine looking peahen making her way across town. The peacock decides that he wants to try his hand at flirting and therefore, in accordance with the "bigger is better" methodology, fans out his feathers in hopes of getting this peahen's attention. The second reason that a peacock spreads its feathers is when it sees another peacock trying to make moves on his peahen. In order to scare off the competition, the peacock fans out his feathers (again using the "bigger is better" methodology) in an attempt to say, "Bro. Back off." I figured it wouldn't be much different than befriending a Michigan squirrel. The first time the other girls and I saw this peacock fully fan out its feathers, our initial thought process was not "I wonder if this peacock is fanning its feather because it's trying to fight or flirt?" Instead, our first thought was "This would make an awesome Snapchat!" Being the true Michigander that I am, I figured this wouldn't be much different than coaxing a Michigan squirrel into becoming friends with me. I inched towards the peacock trying to get the perfect Snapchat picture. I did end up getting the picture. However, about two seconds later the peacock decided it did not want to be my friend. I had gotten a bit too close for comfort. After making an angry squawking noise, the peacock charged at me. End up in the Emergency Room of a foreign country. Explain to everyone that a peacock attacked me while trying to take a Snapchat of it. I gave Usain Bolt a run for his money trying to get away from that peacock, with the other girls right on my heels. Moral of the story? Peacocks are not the equivalent of an exotic Michigan squirrel. They do not want to be your friend, nor do they want to be featured on your Snapchat story.